This article is about the Cosmology of the Bible. For an overview of approaches to the Cosmos in its totality, see Cosmology. For religious cosmology in particular, see Religious cosmology. Biblical cosmology is the biblical writers' conception of the cosmos as an organised, structured entity, including its origin, order, meaning and destiny. The Bible was formed over many centuries, involving many authors, and reflects shifting patterns of religious belief; consequently, its cosmology is not always consistent. Nor do the Biblical texts necessarily represent the beliefs of all Jews or Christians at the time they were put into writing: the majority of those making up Hebrew Bible or Old Testament in particular represent the beliefs of only a small segment of the ancient Israelite community, the members of a late Judean religious tradition centered in Jerusalem and devoted to the exclusive worship of Yahweh. The ancient Israelites envisaged a universe made up of a flat disc-shaped earth floating on water, heaven above, underworld below. Humans inhabited earth during life and the underworld after death, and the underworld was morally neutral; only in Hellenistic times (after c.330 BCE) did Jews begin to adopt the Greek idea that it would be a place of punishment for misdeeds, and that the righteous would enjoy an afterlife in heaven. In this period too the older three-level cosmology in large measure gave way to the Greek concept of a spherical earth suspended in space at the center of a number of concentric heavens. The opening words of the Genesis creation narrative (Genesis 1:1-26) sum up a view of how the cosmos originated: "In the beginning God created the heavens and the earth"; Yahweh, the God of Israel, was solely responsible for creation and had no rivals. Later Jewish thinkers, adopting ideas from Greek philosophy, concluded that God's Wisdom, Word and Spirit penetrated all things and gave them unity. Christianity in turn adopted these ideas and identified Jesus with the creative word: "In the beginning was the Word, and the Word was with God, and the Word was God" (John 1:1). Two different models of the process of creation existed in ancient Israel. In the "logos" (speech) model, God speaks and shapes unresisting dormant matter into effective existence and order (Psalm 33: "By the word of YHWH the heavens were made, and by the breath of his mouth all their hosts; he gathers up the waters like a mound, stores the Deep in vaults"); in the second, or "agon" (struggle) model, God does battle with the monsters of the sea at the beginning of the world in order to mark his sovereignty and power. Psalm 74 evokes the agon model: it opens with a lament over God's desertion of his people and their tribulations, then asks him to remember his past deeds: "You it was who smashed Sea with your might, who battered the heads of the monsters in the waters; You it was who crushed the heads of Leviathan, who left them for food for the denizens of the desert..." In this world-view the seas are primordial forces of disorder, and the work of creation is preceded by a divine combat (or "theomachy"). Creation in the "agon" model takes the following storyline: (1) God as the divine warrior battles the monsters of chaos, who include Sea, Death, Tannin and Leviathan; (2) The world of nature joins in the battle and the chaos-monsters are defeated; (3) God is enthroned on a divine mountain, surrounded by lesser deities; (4) He speaks, and nature brings forth the created world, or for the Greeks, the cosmos. 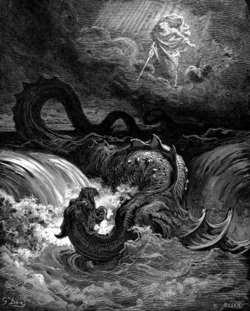 This myth was taken up in later Jewish and Christian apocalyptic literature and projected into the future, so that cosmic battle becomes the decisive act at the end of the world's history: thus the Book of Revelation (end of the 1st century CE) tells how, after the God's final victory over the sea-monsters, New Heavens and New Earth shall be inaugurated in a cosmos in which there will be "no more sea" (Revelation 21:1). The Genesis creation narrative (Genesis 1) is the quintessential "logos" creation myth. Like the "agon" model it begins with darkness and the uncreated primordial ocean: God separates and restrains the waters, but he does not create them from nothing. God initiates each creative act with a spoken word ("God said, Let there be..."), and finalises it with the giving of a name. Creation by speech is not unique to the Old Testament: it is not emphasized in Mesopotamian cosmological thinking, but was prominent in some Egyptian traditions. There is, however, a difference between the Egyptian and Hebrew logos mythologies: in Genesis 1 the divine word of the Elohim is an act of "making into"; the word of Egyptian creator-god, by contrast, is an almost magical activation of something inherent in pre-creation: as such, it goes beyond the concept of fiat (divine act) to something more like the Logos of the Gospel of John. In the ancient world, things did not exist until they were named: "The name of a living being or an object was ... the very essence of what was defined, and the pronouncing of a name was to create what was spoken." The pre-Exilic (before 586 BCE) Old Testament allowed no equals to Yahweh in heaven, despite the continued existence of an assembly of subordinate servant-deities who helped make decisions about matters on heaven and earth. The post-Exilic writers of the Wisdom tradition (e.g. the Book of Proverbs, Song of Songs, etc.) develop the idea that Wisdom, later identified with Torah, existed before creation and was used by God to create the universe: "Present from the beginning, Wisdom assumes the role of master builder while God establishes the heavens, restricts the chaotic waters, and shapes the mountains and fields." Borrowing ideas from Greek philosophers who held that reason bound the universe together, the Wisdom tradition taught that God's Wisdom, Word and Spirit were the ground of cosmic unity. Christianity in turn adopted these ideas and applied them to Jesus: the Epistle to the Colossians calls Jesus "...image of the invisible God, first-born of all creation...", while the Gospel of John identifies him with the creative word ("In the beginning was the Word, and the Word was with God, and the Word was God"). The Hebrew Bible imagined a three-part world, with the heavens (shamayim) above, earth (eres) in the middle, and the underworld (sheol) below. After the 4th century BCE this was gradually replaced by a Greek scientific cosmology of a spherical earth surrounded by multiple concentric heavens, but even so the New Testament writers continued to assume a flat earth and it was not until the Middle Ages that spherical earth was accepted by the Church. 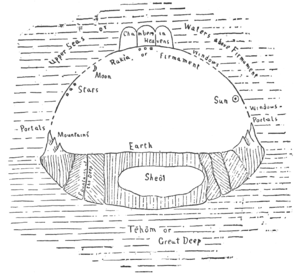 The three-part world of heavens, earth and underworld floated in Tehom, the mythological cosmic ocean, which covered the earth until God created the firmament to divide it into upper and lower portions and reveal the dry land; the world has been protected from the cosmic ocean ever since by the solid dome of the firmament. The tehom is, or was, hostile to God: it confronted him at the beginning of the world (Psalm 104:6ff) but fled from the dry land at his rebuke; he has now set a boundary or bar for it which it can no longer pass (Jeremiah 5:22 and Job 38:8-10). The cosmic sea is the home of monsters which God conquers: "By his power he stilled the sea, by his understanding he smote Rahab!" (Job 26:12f). (Rahab is an exclusively Hebrew sea-monster; others, including Leviathan and the tannin, or dragons, are found in Ugaritic texts; it is not entirely clear whether they are identical with Sea or are Sea's helpers). The "bronze sea" which stood in the forecourt of the Temple in Jerusalem probably corresponds to the "sea" in Babylonian temples, representing the apsu, the cosmic ocean. In the New Testament Jesus' conquest of the stormy sea shows the conquering deity overwhelming the forces of chaos: a mere word of command from the Son of God stills the foe (Mark 4:35-41), who then tramples over his enemy, (Jesus walking on water - Mark 6:45, 47-51). In Revelation, where the Archangel Michael expels the dragon (Satan) from heaven ("And war broke out in heaven, with Michael and his angels attacking the dragon..." - Revelation 12:7), the motif can be traced back to Leviathan in Israel and to Tiamat, the chaos-ocean, in Babylonian myth, identified with Satan via an interpretation of the serpent in Eden. The Archangel Michael, a member of the host of divine beings who attend God in heaven, defeating Satan, the dragon of chaos. Grammatically the word shamayim can be either dual (two) or plural (more than two), without ruling out the singular (one). As a result, it is not clear whether there were one, two, or more heavens in the Old Testament, but most likely there was only one, and phrases such as "heaven of heavens" were meant to stress the vastness of God's realm. Israel and Judah, like other Canaanite kingdoms, originally had a full pantheon of gods. The chief of the old Canaanite pantheon was the god El, but over time Yahweh replaced him as the national god and the two merged ("Yahweh-El, creator of heaven and earth" - Genesis 14:22). The remaining gods were now subject to Yahweh: "Who in the sky is comparable to Yahweh, like Yahweh among the divine beings? A god dreaded in the Council of holy beings...?" (Psalm 89:6-9). In the Book of Job the Council of Heaven, the Sons of God (bene elohim) meet in heaven to review events on earth and decide the fate of Job. One of their number is "the Satan", literally "the accuser", who travels over the earth much like a Persian imperial spy, (Job dates from the period of the Persian empire), reporting on, and testing, the loyalty of men to God. The heavenly bodies (the heavenly host - sun, moon, and stars) were worshiped as deities, a practice which the bible disapproves and of which righteous Job protests his innocence: "If I have looked at the sun when it shone, or the moon ... and my mouth has kissed my hand, this also would be an iniquity..." Belief in the divinity of the heavenly bodies explains a passage in Joshua 10:12, usually translated as Joshua asking the sun and moon to stand still, but in fact Joshua utters an incantation to ensure that the sun-god and moon-god, who supported his enemies, would not provide them with oracles. In the earlier Old Testament texts the bene elohim were gods, but subsequently they became angels, the "messengers" (malakim), whom Jacob sees going up and down a "ladder" (actually a celestial mountain) between heaven and earth. In earlier works the messengers were anonymous, but in the Second Temple period (539 BCE-100 CE) they began to be given names, and eventually became the vast angelic orders of Christianity and Judaism. Thus the gods and goddesses who had once been the superiors or equals of Yahweh were first made his peers, then subordinate gods, and finally ended as angels in his service. There is no concept of a human soul, or of eternal life, in the oldest parts of the Old Testament. Death is the going-out of the breath which God once breathed into the dust (Genesis 2:7), all men face the same fate in Sheol, a shadowy existence without knowledge or feeling (Job 14:13; Qoheloth 9:5), and there is no way that mortals can enter heaven. In the centuries after the Babylonian exile, a belief in afterlife and post-death retribution appeared in Jewish apocalyptic literature. At much the same time the Bible was translated into Greek, and the translators used the Greek word paradaisos (Paradise) for the garden of God and Paradise came to be located in heaven. Babylonian Map of the World (c.600 BCE). The Old Testament concept of the earth was very similar: a flat circular earth ringed by a world-ocean, with fabulous islands or mountains beyond at the "ends of the earth". In the Old Testament period the earth was most commonly thought of as a flat disc floating on water. The concept was apparently quite similar to that depicted in a Babylonian world-map from about 600 BCE: a single circular continent bounded by a circular sea, and beyond the sea a number of equally spaced triangles called nagu, "distant regions", apparently islands although possibly mountains. The Old Testament likewise locates islands alongside the earth; (Psalm 97:1) these are the "ends of the earth" according to Isaiah 41:5, the extreme edge of Job's circular horizon (Job 26:10) where the vault of heaven is supported on mountains. Other OT passages suggest that the sky rests on pillars (Psalm 75:3, 1 Samuel 2:8, Job 9:6), on foundations (Psalms 18:7 and 82:5), or on "supports" (Psalm 104:5), while the Book of Job imagines the cosmos as a vast tent, with the earth as its floor and the sky as the tent itself; from the edges of the sky God hangs the earth over "nothing", meaning the vast Ocean, securely supported by being tied to the sky (Job 26:7). If the technical means by which Yahweh keeps the earth from sinking into the chaos-waters are unclear, it is nevertheless clear that he does so by virtue of his personal power. The idea that the earth was a sphere was developed by the Greeks in the 6th century BCE, and by the 3rd century BCE this was generally accepted by educated Romans and Greeks and even by some Jews. The author of Revelation, however, assumed a flat earth in 7:1. The question of whether the earth was flat, as Scripture seemed to indicate, or spherical as the Greeks taught, was an area in which early Church fathers frequently disagreed, and it was not until the European Middle Ages that the question was settled in favor of the round earth. In the cosmology of the ancient Near East the cosmic warrior-god, after defeating the powers of chaos, would create the world and build his earthly house, the temple. Just as the abyss, the deepest deep, was the place for Chaos and Death, so God's temple belonged on the high mountain. In ancient Judah the "mountain" (actually little more than a hill) and the location of the Temple was Zion (Jerusalem), the navel and center of the world (Ezekiel 5:5 and 38:12). The Psalms describe God sitting enthroned over the Flood (the cosmic sea) in his heavenly palace (Psalm 29:10), the eternal king who "lays the beams of his upper chambers in the waters" (Psalm 104:3). The Samaritan Pentateuch identifies this mountain as Mount Gerizim, which the New Testament also implicitly acknowledges (John 4:20). This imagery recalls the Mesopotamian god Ea who places his throne in Apsu, the primeval fresh waters beneath the earth, and the Canaanite god El, described in the Baal cycle as having his palace on a cosmic mountain which is the source of the primordial ocean/water springs. The point where heavenly and earthly realms join is depicted as an earthly "garden of God", associated with the temple and royal palace. Ezekiel 28:12-19 places the garden in Eden on the mountain of the gods; in Genesis 2-3 Eden's location is more vague, simply far away "in the east", but there is a strong suggestion in both that the garden is attached to a temple or palace. In Jerusalem the earthly Temple was decorated with motifs of the cosmos and the Garden, and, like other ancient near eastern temples, its three sections made up a symbolic microcosm, from the outer court (the visible world of land and sea), through the Holy Place (the visible heaven and the garden of God) to the Holy of Holies (the invisible heaven of God). The imagery of the cosmic mountain and garden of Ezekiel reappears in the New Testament Book of Revelation, applied to the messianic Jerusalem, its walls adorned with precious stones, the "river of the water of life" flowing from under its throne (Revelation 22:1-2). A stream from underground (a subterranean ocean of fresh water?) fertilises Eden before dividing into four rivers that go out to the entire earth (Genesis 2:5-6); in Ezekiel 47:1-12 (see Ezekiel's Temple) and other prophets the stream issues from the Temple itself, makes the desert bloom, and turns the Dead Sea from salt to fresh. Yet the underground waters are ambiguous: they are the source of life-giving rivers, but they are also associated with death (Jeremiah 2:6 and Job 38:16-17 describe how the way to Sheol is through water, and its gates are located at the foot of the mountain at the bottom of the seas). 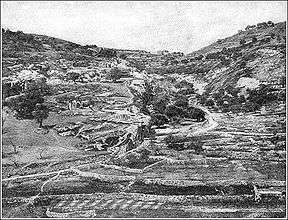 Valley of Hinnom (or Gehenna), c. 1900. The former site of child-sacrifice and a dumping-ground for the bodies of executed criminals, Jeremiah prophesied that it would become a "valley of slaughter" and burial place; in later literature it thus became identified with a new idea of Hell as a place where the wicked would be punished. Beneath the earth is Sheol, the abode of the rephaim (shades), although it is not entirely clear whether all who died became shades, or only the "mighty dead" (compare Psalm 88:10 with Isaiah 14:9 and 26:14). Some biblical passages state that God has no presence in the underworld: "In death there is no remembrance of Thee, in Sheol who shall give Thee thanks?" (Psalm 6). Others imply that the dead themselves are in some sense semi-divine, like the shade of the prophet Samuel, who is called an elohim, the same word used for God and gods. Still other passages state God's power over Sheol as over the rest of his creation: "Tho they (the wicked) dig into Sheol, from there shall my hand take them..." (Amos 9:2). The Old Testament Sheol was simply the home of all the dead, good and bad alike. In the Hellenistic period the Greek-speaking Jews of Egypt, perhaps under the influence of Greek thought, came to believe that the good would not die but would go directly to God, while the wicked would really die and go to the realm of Hades, god of the underworld, where they would perhaps suffer torment. The Book of Enoch, dating from the period between the Old and New Testaments, separates the dead into a well-lit cavern for the righteous and dark caverns for the wicked, and provides the former with a spring, perhaps signifying that these are the "living" (i.e. a spring) waters of life. In the New Testament, Jesus' parable of the rich man and Lazarus reflects the idea that wicked began their punishment in Hades immediately on dying. The New Testament Hades is a temporary holding place, to be used only until the end of time, when its inhabitants will be thrown into the pit of Gehenna or the Lake of Fire (Revelation 20:10-14). This lake is either underground, or will go underground when the "new earth" emerges. The Devil does not inhabit or supervise the underworld - his sphere of activity is the human world - and is only to be thrown into the fire at the end of time. He appears throughout the Old Testament not as God's enemy but as his minister, "a sort of Attorney-General with investigative and disciplinary powers", as in the Book of Job. It was only with the early Church Fathers that Satan was identified with the Serpent of the Garden of Eden and came to be seen as an active rebel against God, seeking to thwart the divine plan for mankind. ↑ Bernstein 1996, p. 134: "The canon of the Hebrew Bible [...] was formed of [...] diverse writings composed by many men or women over a long period of time, under many different circumstances, and in the light of shifting patterns of religious belief and practice. [...] Indeed, the questions under investigation in this book concerning the end of an individual's life, the nature of death, the possibility of divine judgment, and the resultant reward or punishment [...] are simply too crucial to have attracted a single solution unanimously accepted over the near millennium of biblical composition." ↑ Wright 2002, p. 52" "The religious ideology promoted in a majority of the texts that now form the Hebrew Bible represent the beliefs of only a small portion of the ancient Israelite community: the late Judean individuals who collected, edited, and transmitted the biblical materials were, for the most part, members of a religious tradition centered in Jerusalem that worshipped the god Yahweh exclusively." 1 2 3 Aune 2003, p. 119: "During the Hellenistic period a geocentric model of the universe largely replaced the older three-tiered universe model, for Greek thinkers (such as Aristotle and Eratosthenes) proposed that the earth was a sphere suspended freely in space." 1 2 Wright 2002, p. 53: "Biblical texts from all historical periods and a variety of literary genres demonstrate that in Yahwistic circles, that is, among people who worshipped Yahweh as the chief god, God was always understood as the one who alone created heaven, earth, and all that is in them. [...] Yahweh, the Israelite god, had no rivals, and in a world where nations claimed that their gods were the supreme beings in the universe and that all others were subject to them, the Israelites' claim for the superiority of Yahweh enabled them to imagine that no other nation could rival her [...]. Phrases such as 'Yahweh, God Most High, Creator of heaven and earth' [...] and related phrases for Yahweh as creator and almighty master of the cosmos have parallels in earlier Canaanite terminology for the god El. [...] In fact, the Israelites did not create these phrases but inherited them from earlier Canaanite civilizations. Moreover, later editors of the Hebrew Bible used them to serve their particular monotheistic theology: their god is the supreme god, and he alone created the universe." ↑ Walton 2006, p. 190. 1 2 3 Walton 2011. 1 2 3 Schadewald 2008, p. 96. ↑ Keel 1997, pp. 20–22. ↑ Horowitz 1998, p. 30ff. ↑ Hartley 1988, p. 366. ↑ Keel 1997, pp. 40. ↑ Dahl & Gauvin 2000, p. 17. ↑ Farmer 2005, p. 33. Bautch, Kelley Coblentz (2003). A Study of the Geography of 1 Enoch 17-19. Brill. ISBN 9789004131033. Beale, G.K. (2004). The Temple and the Church's mission. InterVarsity Press. Bremmer, J.N. (1999). "Paradise in the Septuagint". In Luttikhuizen, Gerard P. Paradise interpreted: representations of biblical paradise in Judaism and Christianity. Brill. Burnett, Joel S. (2010). Where is God? : divine absence in the Hebrew Bible. Fortress Press. Collins, Adela Yarbro (2000). Cosmology and Eschatology in Jewish and Christian Apocalypticism. Brill. Dahl, Edward H.; Gauvin, Jean-Francois (2003). Sphaerae Mundi. McGill-Queen's Press - MQUP. Davies, William David (1982). The Territorial Dimension of Judaism. University of California Press. Deist, Ferdinand E. (2000). The material culture of the Bible: an introduction. Sheffield Academic Press. Delumeau, Jean; O'Connell, Matthew (2000). Westminster Dictionary of the New Testament and Early Christian Literature. University of Illinois Press. Farmer, Ronald L. (2005). Revelation. Chalice Press. Fishbane, Michael (2003). Biblical Myth and Rabbinic Mythmaking. Oxford University Press. ISBN 0-19-826733-9. Fretheim, Terence E. (2003). "Heaven(s)". In Gowan, Donald E. The Westminster theological wordbook of the Bible. Westminster University Press. Gillingham, Susan (2002). The image, the depths, and the surface. Continuum. Habel, Norman C. (1975). The Book of Job. Cambridge University Press. Habel, Norman C. (2001). "Earth First: Inverse Cosmology in Job". In Habel, Norman C.; Wurst, Shirley. The Earth Story in Wisdom Traditions. Sheffield Academic Press. Hartley, John E. (1988). The Book of Job. Eerdmans. Hess, Richard S. (2007). Israelite Religions: An Archeological and Biblical Survey. Baker Academic Press. Hiebert, Theodore (2009). "Genesis". In O'Day, Gail R.; Petersen, David L. Theological Bible Commentary. Westminster John Knox Press. Hoppe, Leslie J. (2000). The Holy City: Jerusalem in the theology of the Old Testament. Liturgical Press. Horowitz, Wayne (1998). Mesopotamian cosmic geography. Eisenbrauns. Janin, Hunt (2002). Four Paths to Jerusalem. McFarland. Keel, Othmar (1997). The symbolism of the biblical world. Eisenbrauns. Kelly, Henry A. (2010). "Hell with Purgatory and two Limbos". In Moreira, Isabel; Toscano, Margaret. Hell and Its Afterlife: Historical and Contemporary Perspectives. Ashgate Publishing. Kittel, Gerhard; Friedrich, Gerhard, eds. (1985). "Kosmos". Theological Dictionary of the New Testament. Eerdmans. Knight, Douglas A. (1990). "Cosmology". In Watson E. Mills (General Editor). Mercer Dictionary of the Bible. Mercer University Press. Lucas, E.L. (2003). "Cosmology". In Alexander, T. Desmond; Baker, David W. Dictionary of the Old Testament: Pentateuch. InterVarsity Press. Mabie, F.J (2008). "Chaos and Death". In Longman, Tremper; Enns, Peter. Dictionary of the Old Testament. InterVarsity Press. Mills, Watson E. (1998). "Introduction". Mercer Commentary on the Bible: Pentateuch/Torah. Mercer University Press. Noort, Ed (1999). "Gan-Eden in the context of the mythology of the Hebrew bible". In Luttikhuizen, Gerard P. Paradise interpreted: representations of biblical paradise in Judaism and Christianity. Brill. O'Dowd, R. (2008). "Creation imagery". In Longman, Tremper; Enns, Peter. Dictionary of the Old Testament. InterVarsity Press. Olson, Daniel C. (2003). "1 Enoch". In Dunn, James; Rogerson, John William. Eerdmans commentary on the Bible. Eerdmans. Parsons, Mikeal (2008). Acts. Baker Academic. Pennington, Jonathan T. (2007). Heaven and earth in the Gospel of Matthew. Brill. Perdue, Leo G. (1991). Wisdom in Revolt: Metaphorical Theology in the Book of Job. Sheffield Academic Press. Reike, Bo (2001). "Hell". In Metzger, Bruce Manning; Coogan, Michael David. The Oxford guide to ideas & issues of the Bible. Oxford University Press. Ringgren, Helmer (1990). "Yam". In Botterweck, G. Johannes; Ringgren, Helmer. Theological Dictionary of the Old Testament. Eerdmans. Rochberg, Francesca (2010). In the Path of the Moon: Babylonian Celestial Divination and Its Legacy. Brill. Ryken, Leland; Wilhoit, Jim; Longman, Tremper; Duriez, Colin; Penney, Douglas; Reid, Daniel G., eds. (1998). "Cosmology". Dictionary of Biblical Imagery. InterVarsity Press. Sarna, Nahum M. (1997). "The Mists of Time: Genesis I-II". In Feyerick, Ada. Genesis: World of Myths and Patriarchs. New York: NYU Press. p. 560. ISBN 0-8147-2668-2. Schadewald, Robert J. (2008). Worlds of Their Own. Xlibris Corporation. Seybold, Klaus (1990). Introducing the Psalms. T&T Clarke. Smith, Mark S. (2003). The Origins of Biblical Monotheism. Oxford University Press. Stordalen, Terje (2000). Echoes of Eden. Peeters. Tigghelaar, Eibert J.C. (1999). "Eden and Paradise". In Luttikhuizen, Gerard P. Paradise interpreted: representations of biblical paradise in Judaism and Christianity. Brill. Walton, John H.; Matthews, Victor H.; Chavalas, Mark W., eds. (2000). The IVP Bible background commentary: Old Testament. InterVarsity Press. Walton, John H. (2006). Ancient Near Eastern Thought and the Old Testament: Introducing the Conceptual World of the Hebrew Bible. Baker Academic. ISBN 0-8010-2750-0. Walton, John H. (2011). Genesis. Zondervan. Welch, John Woodland (2009). The Sermon on the Mount in the light of the Temple. Ashgate. Wright, J. Edward (2004). "Whither Elijah?". In Chazon, Esther G.; Satran, David; Clements, Ruth. Things revealed: studies in early Jewish and Christian literature in honor of Michael E. Stone. Brill. Wyatt, Nick (2001). Space and Time in the Religious Life of the Near East. Sheffield University Press.